The real secret of a strong and lasting memory lies in the foods and herbs we eat. The medical community estimates that the average person has over 60,000 thoughts going on each day. Some of the information is thrown away and then goes into our storehouse of knowledge. Keeping the memory sharp and increasing concentration power has been a centuries-old dream of man. Even in ancient times, memory retention was important, but maybe more so now, as the average person has so many things to remember. Our world has also become much more competitive and retaining information is important in our everyday lives. Whether your concern is forgetfulness or short-term memory loss, one must be aware that there are very specific factors involved that can cause the problem, even at a young age. So, instead of simply attributing this to a natural decline in cognitive functioning, other factors must be considered. Other causes could be drug or tobacco abuse, alcohol abuse, certain medications, stress and depression, nutritional deficiency, sleeplessness, stroke, head injury and dementia. Studies show that the certain herbs may help to increase circulation in the brain, stimulate the cerebral cortex and help oxygenate the brain. Rosemary leaf (Rosmarinus officinalis) is a popular spice but also a widely used medicinal agent that has been used throughout history for muscle and joint pain, hair loss as well as to enhance memory. 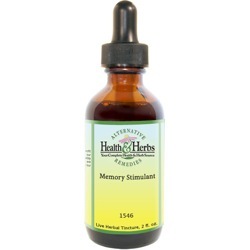 Studies have shown that the herb has the potential to enhance the overall quality of memory as well as secondary memory factors. Studies of the herbal extract of Rosemary discovered that the most active compound of the herb, 1, 8-cineole, may help to improve accuracy of memory, speed of processing information and even mood. Recent research in the science surrounding the herb has shown that it inhibits the breakdown of acetylocholine, which is the compound of the herb that plays a big role in section of the brain that isi responsible for memory and reasoning. Borage leaf (Borago officinalis) is packed with healthy nutrients that are so good for the body, in many ways. One of the most important nutrients in the herbal extract is essential fatty acids, something our body needs for optimum health. Essential fatty acids must be ingested in the diet, and it can directly affect our moods, internal inflammation and, various cellular functions. Borage is well known for its soothing qualities and has been used for nervous conditions. Herbalists ofen recommend this herbal remedy to help restore the adrenal glands to their natural balance, which in turn helps create a calmer body and mind. Today's translation of this healing herbal extract is to help people deal with everyday stress and exhaustion. The natural sedative effects have been suggested often for taking off the nervous edge some people experience. It is believed to work well for easing depression and mood swings that are often associated with menstrual cycles and menopause. Eleutherococcus Senticosus, also known as Eleuthero, has been used to restore energy and vitality. The herb has gained a reputation for its numerous benefits for good health. It is now a widely used herb to help improve memory and increase longevity. It has been used during convalescence, for physical and mental stress, geriatic debility, and a wealth of other issues. It has been used for over 2000 years as a folk remedy for heart ailments, rheumatism, to promote healthy appetite, and increase stamina. Eleuthero root tincture helps the body to adapt to stress, in a good way, it makes the stress response more efficient, helping you stay clear-headed when under pressure. The herb's popular use is to increase mental alertness, help with sustained energy levels over long-term, and without the energy rollercoaster of energy drinks or other caffiene stimulants. Licorice Root (Glycyrrhiza glabra) is considered to be a nootropic agent, which is a substance that action the mind, improving circulation and enhancing the memory and mental function. It is an excellent addition to a formula that is intended to benefit the brain, as it is said to help harmonize body/mind/spirit connections. The protective quality of the herb extract may be attributed to the antioxidant properties. Licorice is also known to help counter toxic poisoning from herbicides, pesticides, lead and other toxins. Less oxidative stress results in reduced brain damage and improved neuronal function, which thereby helps enhance memory. Lobelia leaf (Lobelia inflata) is an adaptogen herb, and has been considered to be one of the most powerful and useful herbs on the planet. This is why the herbal tincture is used in a variety of herbal formulas, as a "thinking herb," meaning it will take the beneficial phytochemicals of other herbs with it, to places in the body which need healing. Lobelia leaf extract is one of the best known herbs for removing congestion, whether it is in the respiratory tract or in the central nervous system. It is also believed to be an effective detoxifying herb, as it encourages perspiration, is diuretic in nature, and clears phlegm. Lobelia contains 14 alkaloids, and the most active of these is lobeline, which relaxes muscles and decreases blood pressure. The herb seems to play both sides of the nervous system, by leaving the recipient more relaxed and focused. Studies with mice indicated that it may stimulate the release of dopamine and norepinephrine in the brain. That is the neurotransmitter which can affect mood and stimulate the pleasure center of the brain, and is also involved in memory. Valerian root (Valeriana officinalis) is a traditional herbal remedy with many uses, and it is now being widely supported by modern science for its medicinal properties. Valerian root contains valerenic acid, which is known to increase the amount of GABA, the neurotransmitter responsible for regulating nerve cells. The herbs use can have calming effects on the nervous system. Behavioral studies on mice show that the use of Valerian root extracts seemed to support its therapeutic effects in treating different types of anixety, including social anxiety, and may those suffering with depression. Ingredients: Gotu Kola Leaf, Rosemary Leaf, Borage Leaf, Eleuthero Root, Licorice Root, Lobelia Leaf, Valerian Root, Structured Water, 20% Alcohol. Non-Alcohol: Gotu Kola Leaf, Rosemary Leaf, Borage Leaf, Eleuthero Root, Licorice Root, Lobelia Leaf, Valerian Root, Structured Water and Vegetable Glycerin. All of our ingredients are Certified Organic, Kosher, or Responsibly Wildcrafted. No genetically modified organisms (GMO's) are involved. All other products that are distributed by us meet our high quality standards.